Fr. 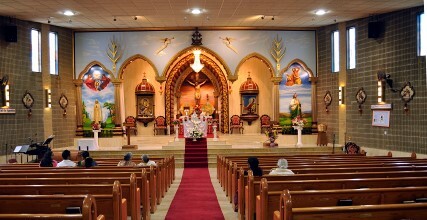 Philip Thodukayil started an additional Saturday evening mass at 6:00 P.M. on every third Saturdays of the month at Our Lady of Mount Carmel Church in Darien. First Holy Communion of 20 students at St. John Breuf Church in Niles. First Solemn Feast Celebration of the mission at IHM Church in honor of Pope St. Pius X. Bishop Mar Kuriakose Kunnacherry sent a particle of the scull cap worn by St. Pius X and personally gifted to Bishop Mar Mathew Makil as relics. Bishop Mar Mathew Moolakkatt was the main celebrant. Peter and Salykutty Kulanagara were the sponsors (prasudenties) of the feast. First Pre-marriage Course offered by Chicago Knanaya Catholic Mission under the leadership of Vicar General Fr. Abraham Mutholath and Family Commission headed by Tonny Pulllappally. Nineteen youth participated in the course. First Religious Education Festival at Thaft High School. Youth Ministry Class started at OLV Church on the First Sundays of every month from 3:00 P.M. to 5:00 P.M.
Beginning of Children Ministry (KG to 3rd graders) and Teens Ministry (4th – 8th graders at OLV Church. Celebrated the Sacerdotal Silver Jubilee of our Mission Director Rev. Fr. Abraham Mutholath at OLV Church. Bishop Mar Jacob Angadiath was the chief guest. Mission members contributed a substantial amount ($44,337) to the church building fund during Jubilee Celebration meeting at OLV School Hall. Second Religious Education Festival at Thaft High School. First presentation of Knanaya Kudiyetta Ballet with original songs published by the mission.